Electronic Arts Inc. (NASDAQ: EA) and the National Football League (NFL) announced the launch of the Madden NFL Club Championship, a landmark competitive gaming and esports event within the Madden NFL Championship Series (MCS) involving all 32 NFL Clubs. 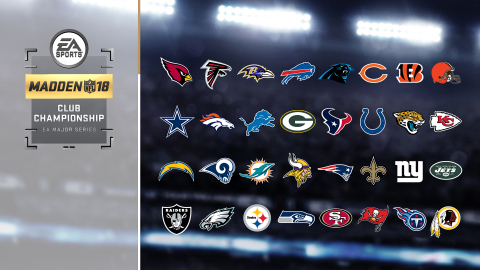 With involvement from every club across the League, this is the largest competitive gaming commitment ever by a U.S. professional sports league, and competition begins in less than 24 hours with the launch of EA SPORTS Madden NFL 18 G.O.A.T Edition for Xbox One, the all in one videogame and entertainment system from Microsoft, and the PlayStation®4 computer entertainment system on August 22nd. Players can sign up today to compete at www.NFL.com/Madden. Millions can compete in pursuit of winning the Madden NFL Club Championship for their favorite NFL team. Players will qualify first through online competition with high-performers advancing to tournaments at select NFL stadiums, popular cultural landmarks and more. Once the final 32 players are identified, one per NFL team, they will compete in the Madden NFL Club Championship Live Finals, a tournament occurring first at the Pro Bowl Experience in Orlando, FL and culminating at the Super Bowl Experience Driven by GMC in Minneapolis, MN with the winner receiving a cash prize and two tickets to Super Bowl LII. The Madden NFL Club Championship is one of three currently announced Madden NFL Championship Series EA Majors, the other two are the Madden NFL Classic on October 20-21 and the Madden NFL Challenge on December 15-16. EA Majors are the pinnacles of the Madden NFL Championship Series with only the top players qualifying. The Madden NFL Championship Series purse is $1.15 million for the season. All players can compete in the Madden NFL Championship Series and for a chance to qualify to compete in an EA Major through many means. These competitive formats include online matchmaking now incorporating the heavily engaging Madden NFL Ultimate Team Champions (MUT Champions) experience, grass-roots tournaments known as Challenger Events and mid-level Premier Events. EA has the mission to make stars of all our players by making competitive gaming accessible to all. Quickly becoming a leading entertainment brand in competitive gaming, with top-selling videogame franchises Madden NFL football, EA SPORTS FIFA and Battlefield 1, award-winning interactive technology and cross-platform digital experiences, EA’s competitive experiences ignite the passion of millions of players and spectators through competition around the world. For more details on the entire Madden NFL Championship Series ecosystem, as well as details on the new Madden NFL Ultimate Team Champions (MUT Champions) experience, please visit www.maddenchampionship.com.